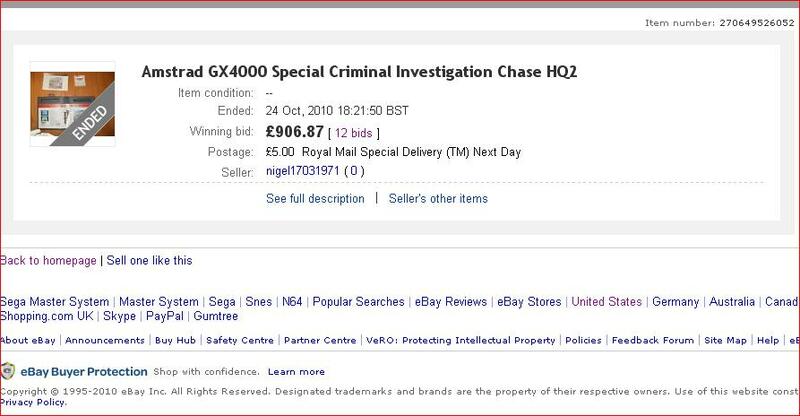 “SPECIAL CRIMINAL INVESTIGATIONS : CHASE HQ 2″ APPEARS ON EBAY? Well it looks like the holy grail of Amstrad carts, and indeed games across all the Amstrad platforms generally has surfaced for sale on Ebay! Unfortunately it looks rather suspicious – the seller “nigel7031971″ has zero feedback(!!) and no other auctions up, and there’s only one photo shown for the item that looks rather familiar…. Hmmm!!! Note that photo was put live on this very website in December 2008! The photo was originally taken by the only known owner of the game James Bridges several months previous which he posted on the old cpczone.net forums (now sadly defunct) – of course that is where we got it from. Seems this Ebayer has then taken it from our site! We will try and contact the seller to clear this up, but for the time being …. our advice is to be very cautious. So at least we now know that it isn’t James selling the cart under a different name to protect his identity. The seller has replied to my email. It seems that he will allow collection in person and testing on his own GX4000 console – which is good news. The worrying part of his reply is that he appears unable to take any more, or should I saw ‘new’ photos. Come on … who at least doesn’t own a digital camera or mobile phone that takes pics these days?? The auction is no longer available and has been removed. Draw your own conclusions. What a shame and waste of time, getting everyone hopes and expectations up! Oh well …. welcome to the murky world of collecting/trading rare retro games! Over the years I’ve managed to purchase all the GX4000 games off Ebay. I’m only missing boxes and manual for about 3 games, the Trojan Light Phazer, and of course the legendary Chase HQ 2 (more on that another time). I’ve been watching Ebay at least once a week since about 2000 and have traded many GX items to achieve my collection, which is still yet to be completed, but I believe I have a good enough level of experience here to share what I think you should be paying and what they should be valued at.